I’m just bring over some pre-birth posts from an old site. Feel free to have a look at how we set everything up! With baby Gracie getting ever closer, I thought it would be fun to go through our current Set-Ups. We will look at the Nursery, Travel System (pram), Cloth Nappies, Changing Bag, and Baby Toys. Once Gracie has arrived we’ll do a look back and see just how under-prepared we really were. We had a good idea of what we were looking for when we started researching prams, pushchairs, and car seats. Preferably we wanted something that was an “all-in-one” system, that is to say something that we could use for a significant length of time, and something which was compatible with each other. 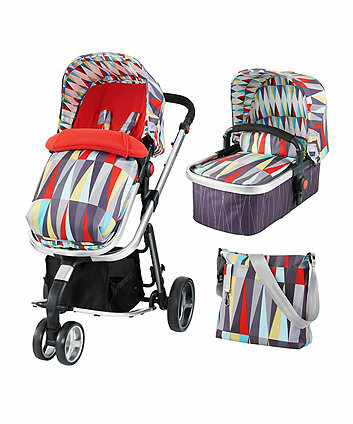 With that in mind we settled on the Cosatto Giggle 2 travel system. Firstly, we just love the Cosatto designs, they are brightly coloured and look good/sturdy. We decided on the Funfair colour scheme because we thought it looked bright, but gender neutral just in case we have another baby, and I am a sucker for greys and isometric patterns. I also quite liked the use of brushed metal, especially on the little cot as it gives the impression that it strong and protective. So let’s talk about ease of use! Neither Ruthie or I currently drive, which means we needed something that was easy to put up and down for when we decide to brave public transport. Before settling on this, we had practised with another brand and it putting it up/down was a complicated affair. That ins’t the case with the Giggle 2, the pram pops off and then with a press of a button it collapses neatly down, perfect for busses and trains. The final reason we got the Giggle 2 is because it came with a car seat as well (yes, we don’t drive at the moment but we are hoping to change that soon). That means it was a great price for everything we needed. It also came with a rather fetching changing bag (one of two that we’ve got prepped and ready go for when Gracie decides to arrive). We wanted a nice, light coloured room in a sort of Scandinavian style. As we started the nursery before we knew the gender we stuck with gender neutral colours, specifically going with light blue, white, and grey, as well as allowing for natural wood tones. Not having a particularly large house we tried to be as conservative with our space as possible, making sure that we got our cot, changing table, and wardrobe in, and fitting anything in around those. The first thing we bought was our Baby Box from the Baby Box Company. We knew that as long as we had then whatever else happened our little girl would have somewhere to sleep. Originally we were planning to move the box around the house as we needed it but since then someone from our church kindly donated a Moses basket which has been set up downstairs, so the Baby Box is now sitting in the cot. The cot, changing table, and shelves are from Ikea. Reasonably priced and sturdy, we didn’t fancy breaking the bank on these items. That said I am very happy about their appearance and think they suit the rooms colour. What I particularly like is that the changing table has lots of little hooks and trays to (hopefully) make the changing experience easier. We opted to use the bottom shelf to display our Cloth Nappies. We’d toyed with the idea of placing them away but actually preferred the idea of being able to select what nappy you wanted, especially as our nappy stash is made up of different brands. We spent a little more on the wardrobe. From the moment Mummy spotted it she knew that we had to have it for the nursery. By Mama & Papas, it is from the Lawson range which blends together white and wood in the perfect rustic combination. Like with the changing table, what we liked about the clothes rail is that we are able to see of the different outfits that we could put on Gracie. We spend so much time, and energy (and money) on picking out clothes for our baby, we just wanted to be able to see them. The flat bottom of the rail also gives you space for more storage, lots of people opt to use it for blankets, or shoes, but we decided that it was better suited for the small army of soft toys (shout out to Lotso, Rex, Elmer and Stitch). So with the big set-pieces out of the way, we decided to pick up bits and bobs as we found them. As mentioned above we purchased our shelves from Ikea, and they have been perfect for displaying books and soft toys. We also found a lovely small set of house-shaped shelves in a shop called The Range. These were absolutely perfect for filling in some empty wall space that we had above the changing table. We filled one with our Disney Tsum-Tsum collection, and the other houses Boris the Bear (I have been told the rainbow llama cannot live on-top of the house and he has since been moved). Wanting to inject a little more colour into the room, I picked up lovely thick rug from Flying Tiger Copenhagen (which is sort of like Ikea, but for tat, and it has to be one of my favourite shops). As you can see from the picture below we also swapped out the cots handles for some brightly colour animals, also from Tiger. So at a little over three months old, our baby girl weighed in at a sizable 16lb (or 7.2kg if you are like me). Her 3 to 6 month clothes hasn’t fit in quite a while so we’ve had to buy lots of 6 to 9. As much as we try to buy our clothes from organic sources, sometimes time, and money, have limited us. Sometimes we end up buying standard clothes to bulk out our collections, especially when she’s outgrowing her clothes so quickly. We picked up these long-sleeved vests from Sainsbury’s for £8 or £9. Technically from their boys range, we thought those colours complimented the rest of her clothes, and we saw no reason for it to be gendered. We adore that mustard/yellow colour on her, and find that it pairs well with most of her leggings. Mummy has also been pushing me to put her in some more monochrome clothes, so the black and white, and grey vests will start that off well. We also recieved a knitted care package from Gracie’s GG. We got a lovely collection of headbands for Gracie, as well as a rainbow coloured knitted hoodie that just perfect for her to wear in her pram, or in the sling. Today is Gracie’s second round of immunisations. While these shouldn’t be as bad as the first lot (as we won’t be having Men B), however we are still preparing for a long night. We considered using disposable nappies for the next two weeks as the rotavirus vaccination is “live”. However after a little bit of research we’ve decided to keep her in cloth, and just handle our wash cycle with extra care. We already wash our nappies with napisans which acts as a disinfectant. We’ve made sure that we’ve got plenty of calpol to battle any fevers, aches and pains. I’ve also been looking up some shows to watch while I’m on my baby soothing shift should we need it. So here is a not so fun fact for you all: It is estimated that it can take up to 500 years for a standard disposable nappy to degrade in a landfill. I am not going to pretend that I am super hot on recycling, and that I was automatically leaning toward cloth nappies because they just look awesome. But I mean, 500 years? At the rate that babies go through their nappies too. I just couldn’t bring myself to add to that. Now I know that people use disposable nappies for a variety of reasons, and I am not here to moralise you on the subject, but I would ask you all to consider using reusable nappies for your children, especially if you are in a position to do so. So the one draw back to using cloth nappies can be the upfront cost of getting everything you need. In the long run it costs less than disposables, but you do need to front most of that at the beginning. We knew that we were going to be using cloth nappies before we got pregnant, and we buying up everything we could as soon as we found out we were expecting. The joys of the cloth nappies market is that there are plenty of pre-loved nappies, and we got some of those, and some new ones to bring our stash together. The majority of our pre-loved nappies are Tots Bots EasyFit Star all-in-one style nappies. Ours came in pretty good condition, and after a a couple of washes, and one evening spent cleaning the velcro, these are ready to go. As these are second-hand the style is no longer available from Tots Bots, but I have to say I am very happy that they are fairy-tale themed. These seem pretty thick, and absorbent so I am hoping that they will be good for the overnight stretch. We also purchased a set of Little Lamb Onesize Pocket Nappies. These are mostly in bold block colours, but we’ve also bough a few Hawaiian shirt themed ones. These use poppers not just to adjust the size, but also to fasten them closed. We have dithered on the subject of newborn cloth nappies. At first we thought we’d pick up some biodegradable ones and call it a day, but after doing a little more research we decided to take the plunge and buy some newborn reusables. When considering containment and seepage (something nobody wants to think about) we decided that two-pieces nappies were the best, with an absorbent centre and outer waterproof wrap. We’ve purchased a mixture of Little Lamb Bamboo and Microfibre nappies, Bamboo are extremely absorbent but slow to dry, while the Microfibre hold less but come out of the washing machine practically dry. To cover the Little Lamb nappies we’ve bought some Motherease Rikki Wrap Covers which combine nicely with the Little Lambs to (supposedly) provide a leak-free experience. We liked these covers partly for the aesthetic but also the apparent ease of use, going on suggestions we found online. In the end we got a couple of these in different sizes so that we will be properly covered until she is big enough for the all-in-ones. Bulking out our collection we’ve got some Charlie Bananas, Bum Genius, Smartie Pants and Alva nappies. I actually really like Alva nappies and will be picking up some more soon, especially as they are good quality for the price. One thing we’ve also picked up was some Charcoal booster pads. These will slip in to pocket nappies and they give us an extra hour or so of wear, perfectly for when we’re out and about.